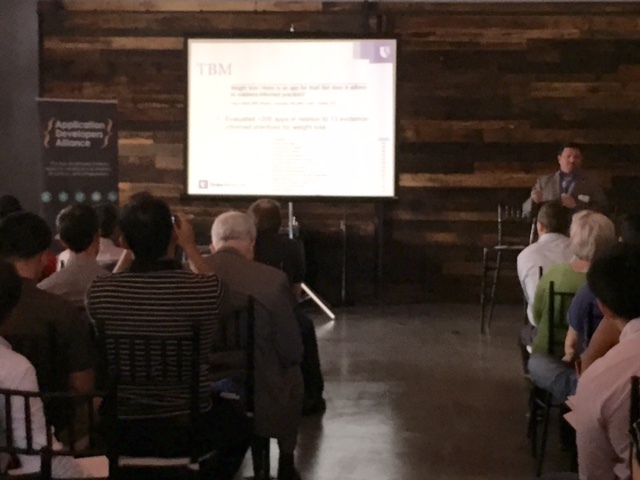 The Application Developers Alliance checked another first off of our list with the inaugural mHealth Apps Workshop in Raleigh, NC on May 14. Over 60 attendees and 10 speakers came in from around the country to discuss how mobile technology is enhancing the patient care experience in the healthcare industry. Watch these videos capturing insights from the live discussions and presentations filmed at the workshop. Also read the event recap blog, and view the full agenda. To find an event in a city near you, click here. MobileSmith's COO Bob Dieterle kicked off the session with a revealing look at the challenges facing hospitals as they build mobile experiences for their patients. "Hospitals know they have to go mobile," said Dieterle, "but the problem is that they don't understand the user experience and don't know where to find developers to build these apps." Dr. Bernard Fuemmeler, Associate Professor and Director of mHealth@Duke at Duke University, provides a thought-provoking presentation on the state-of-the- science on mHealth apps. In his talk, he highlights how many apps designed for managing health behaviors, like weight-loss or smoking, have traditionally fallen short of including evidence-based practices and effective behavioral strategies. Brad Bacon (VP Product, Healthgrades) talks about his experiences in the mobile space prior to joining the healthcare industry. Our second session was an interesting discussion on analytics in mHealth with panelists from WillowTree Apps, MediPortal, and PadInMotion. Much of the conversation centered on data sharing between providers and patients. Ricardo Funk (Senior iOS Engineer, MediPortal) said "if we give the patient the power to control their own medical records, patients will be far more willing to share that data with providers." Wearables, Wearables Everywhere - When Will All the Data Be Useful? The workshop concluded with a fascinating panel on the state of wearables in the healthcare industry, featuring speakers from Duke Medicine, UNC Medical, Validic, and Strap. Having two clinicians on the panel allowed for interesting perspectives on the challenges of integrating wearables into the patient care experience.